SAN DIEGO — In the Chargers’ topsy turvy world of will they or won’t they bolt to Carson — what remains a constant for the next four years at least will be Philip Rivers at quarterback. On Saturday, the Chargers issued a press release announcing that Rivers inked a contract extension lasting through the 2019 season. According to reports, the contract is worth $65 million in guaranteed money and includes a no-trade clause in the contract. “We made a high level of commitment to Philip and he in return made a high level of commitment to us,” Telesco said, adding that the signing showed team ownership’s commitment to winning. Talking with the media, Rivers said that at the end of the day, what was most important to him was being able to finish his career as a Charger. “We’ve had a lot of good — a lot of wins,” said Rivers, adding that they’re still missing that one thing which we’re all after, a championship and hopefully in this next stretch we can get that done. “My lack of excitement for a potential move was more about the thought of leaving this community, than it was about a disdain for L.A.,” Rivers said, citing that all but one of his children have been born in San Diego, and where their family has grown up over the last decade. Rivers hasn’t received any indication from ownership, he said, on what the future plans are for the team. 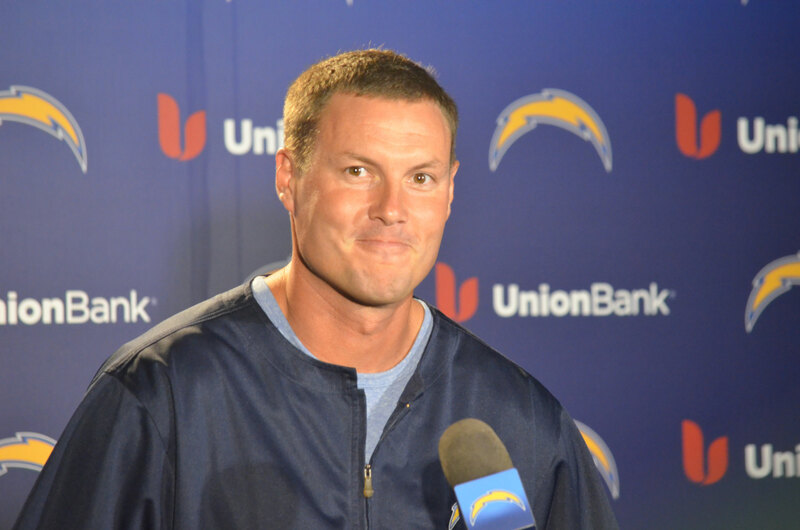 “Unless something changes from Tom’s standpoint or upstairs, I’m going to be a Charger wherever we are,” said Rivers. Telesco said there were two factors expressed in wanting to sign Rivers to a contract extension: The first is that the organization feels he can lead the team to a championship, and two, he represents the organization with class, character and humility — case in point, after learning the deal was done, Rivers ordered a three-topping pizza from Domino’s. On the same day Rivers and Telesco spoke to media about the extension, plans and renderings for a possible $1.7-billion joint stadium between the Chargers and the Oakland Raiders in Carson, Calif. were unveiled to the public. But at 34, will the quarterback be ready to retire at the age of 38 when his contract is up? Rivers said signing the contract extension was a “relief” in the sense that there won’t be any uncertainty next offseason. This marks the fifth year that Beth Dammeyer has volunteered for the Wounded Warrior Tennis Camp.